We can no longer fathom watching standard definition TV broadcasts. We HAVE to view our sporting events, National Geographic programming and late night comedy in HD — High Definition. HDClarity is an e-zine for those wanting to develop more trust, understanding and camaraderie in their work environment, and their life in general. A smoother running team is a more profitable team. They get things done faster, for less cost. If you’d like to discover methods for developing High Definition Clarity in your daily life, please read on. Christopher Duplessis is probably the best two-wheel-drive rally car driver in the U.S. In a world of 300-horsepower, rock-star-driven, all-wheel-drive Subarus, Mitsubishis, and Ford Fiestas, Chris normally manhandles a 130-hp front-wheel drive 1990 Volkswagen Golf to 2WD championships year after year. I had the privilege of co-driving for Chris in Colorado for the rally that wrapped up his 2008 Championship. Chris is the original “can-do” guy. As a result, he’s always winning-even when he doesn’t. What am I talking about? First, I need to explain Eckhart Tolle’s Three Responses. In his work, Tolle refers to the Three Modalities of Awakened Doing. What he means is that, no matter what you do, a successful connection to an event requires acceptance, enjoyment, or enthusiasm. If you’re engaged in any other way, you’re not going to be happy with the results. 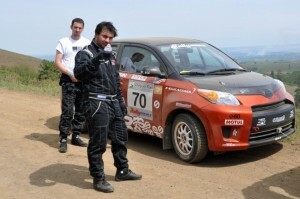 Chris was tapped by 0-60 Magazine to pilot a 2010 Scion XD sedan that was hurriedly prepped for running the Oregon Trail Rally. By prepped, I mean a roll cage had been installed, and some pretty awesome Tein suspension was bolted underneath. Other than that, it was pretty much off the shelf, putting Chris at a huge perceived disadvantage. Although the car was paid for by somebody else, it had low power, an open differential (only one wheel pulling), and was not particularly light. Plus there were lots of uphill racing sections on the course and Chris had a novice co-driver. Other drivers would have looked at this opportunity (any paid ride is an opportunity) but found fault with the car, the differential, the lack of power, the hurried preparation, the inexperienced co-driver and crew. They would have known they weren’t going to win. In contrast, Chris spent most of the weekend in unbridled enthusiastic engagement, laughing as he snapped the front bumper loose in a high-speed water crossing, smiling as a rock punctured the floor pan, not lifting the throttle corner after corner, blind crest after blind crest, totally committed to the project, even though this car was not supposed to be a competitive rally car. Chris didn’t win. He came in second to a turbo-charged fully sorted out Ford Focus. But his 2010 Championship season is still intact with only two events to go. And 0-60, Scion, and Tein got their money’s worth from Chris Duplessis because he doesn’t know how to respond to anything in a manner inconsistent with Tolle’s Three Responses. He chooses to respond with acceptance, enjoyment, or enthusiasm. And usually, he chooses all three. Are you getting your money’s worth out of you? Your people? Your relationships? If not, perhaps you’re not responding to situations in the best way. Next time you’re faced with an issue that’s about to set you off, weigh the value of satisfying your emotional issues-throwing your jack, yelling at your direct report-against the overall success of the mission. Would one of the Three Responses serve you better?